Although I love them, in this post, I am not talking about flowers. I am talking about Rose Blossoms of another kind - my fabulous team members! Let me start out by asking you to think back to the last time you spent $49 on paper crafting supplies. Wouldn't it have been nice to get a fabulous discount on all of those supplies knowing that if you forgot to pick something up that the discount would always be there? Well, that's what you get when you join Close To My Heart! The new consultant kit is just $49, and it is filled with loads of great product. 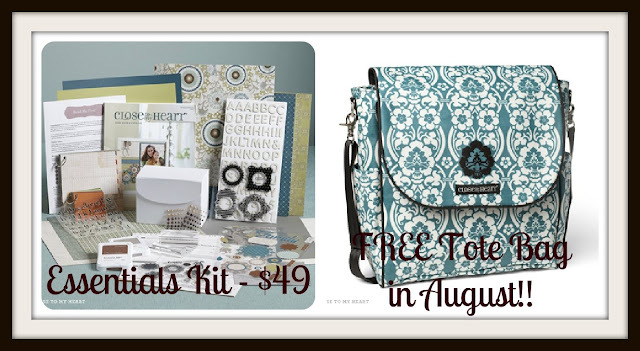 As a bonus in August, you also receive a beautiful Damask tote bag when you join Close To My Heart! Some of my team members are hobbiest consultants. That means that they LOVE Close To My Heart products, they love being a part of the team, and they love the discount. With Close To My Heart's low quarterly minimums, it's easy to to be a hobbiest! Some of my other team members are part-time consultants. They love all the same things as my hobbiest consultants, but they also work their business into their already busy lives so that they make a little money. Who doesn't like a little extra money to take the family out to dinner, buy those little extras, or contribute to the household income? I also have some business builders on my team. They recognize that Close To My Heart can provide a good steady income just by sharing what they love through classes and Gatherings! In case you haven't been a reader for long and don't know, Close To My Heart is my full-time job. I get to do what I love every single day! I also want to tell you a little about what I offer my team. Guidance - I never want anyone to feel like they are in the dark about something, so I work personally with team members and on the Facebook group to help guide them on their journey with CTMH. No matter what type of Consultant, I treat everyone the same. It is terribly important to me that everyone feel valued no matter what type of consultant they choose to be. The great thing about CTMH is that your goals can change according to what is going on in your life. Monthly Challenges - I pose an optional monthly challenge, and it's a fun way for me to teach my team. The rewards are different every month. 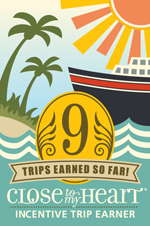 Experience - In total, I have been with CTMH over 5 years. I have also been paper crafting for over 20 years! To read about me, just click on my Resume tab at the top of the page. Private Facebook group - This is a great place - and a safe place - to share artwork and to ask questions. Do you have questions about the Close To My Heart opportunity? I would love to answer them for you! You can telephone (763.227.0583) or e-mail me (girlygirlrose43@msn.com). If you are ready to join, just go to my WEBSITE, and fill out the six-question form. You'll have almost immediate access to the online office, your own personal (and free!) website, and you will have your kit and tote bag on your doorstep in the next week! Very sincerely, I would love to call you a Rose Blossom!! Proud to be a Rose Blossom! Brenda, whoever joins your team is blessed beyond measure! You are such a great lady! Love being on your team! miss you dearly. always admired your guidance. :) just celebrated 6 years with CTMH.